Mohs micrographic surgery is a highly specialized surgical technique for skin cancer removal. Developed by Dr. Frederick Mohs in the late 1930s, the technique is now practiced throughout the world. Mohs surgery allows for the immediate microscopic examination of the removed cancerous tissue. This eliminates days of waiting for a pathology report from an outside lab. The cancer is shaved off one level (layer) at a time and is immediately examined under the microscope. If cancer extension is seen at the margins, then additional tissue layers are shaved off. This process is repeated until all the margins are clear. This method has the highest cure rate while preserving healthy tissue and maximizing cosmetic results. Often performed as an outpatient procedure in a physician’s office, this procedure is performed by a dermatologist with specialty training in Mohs surgery. The first step is injecting the area to be treated with a local anesthetic using a tiny needle. The Mohs surgeon then removes the visible cancer along with a thin layer of additional tissue. This is known as a level. It is not possible to predict the extent of the skin cancer, however, many cases have been completed in 1-3 levels of tissue. The patient waits with a temporary bandage while the tissue is processed by the Mohs technician and then examined by the Mohs surgeon. The technician processes the tissue by cutting, staining and mapping. Then, the specimen is frozen, thinly sliced, and placed on slides for examination under a microscope. 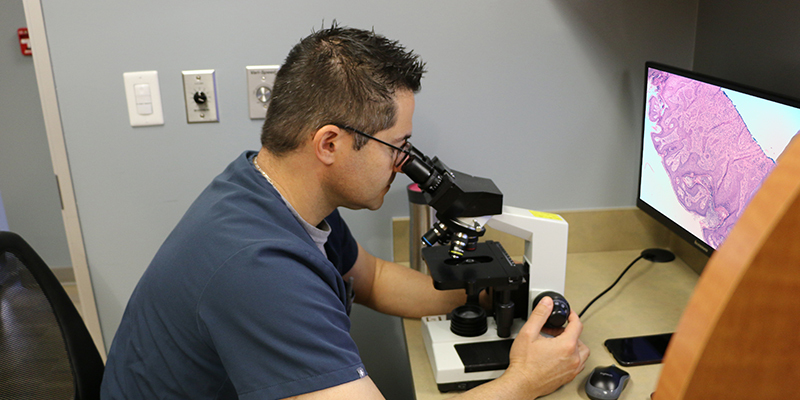 The Mohs surgeon examines the slides of the specimen carefully to be sure all margins (edges) are clear of cancer cells. If remaining areas of the cancer are identified, additional tissue will then be removed. When all residual cancer is removed, the remaining defect (open wound) can then be reconstructed (closed). Surgical repair (reconstruction) depends on the size, depth, and location of the defect. In some cases, the defect is in a discreet area or is small in size and can be closed by the Mohs surgeon. Sometimes the location of the defect is on a visible area of the body such as the face which may require a plastic surgeon who is able to use more advanced techniques to ensure a cosmetically appealing outcome. For patient convenience Mohs micrographic surgery and reconstruction can be performed on the same day at the same facility. It is possible, however, to wait up to one week between Mohs surgery and reconstruction due to patient medical reasons. Reconstruction can be done under local anesthetic as an office procedure or under IV sedation in an outpatient surgical center. The unique set-up of the Skin Cancer and Reconstructive Surgery Center allow same-day and same-place reconstruction and Mohs surgery.